Kyle Schroeder joined the firm as an intern in May of 2013. He now works primarily in the International Public Affairs group. His work focuses largely on a U.S. State Department International Narcotics and Law Enforcement rule of law project. The project’s goal is to setup the legal framework for missing persons DNA databases in Central America. Before joining GTH-GOV, Kyle interned at the Washington State Senate Majority Coalition Caucus as a policy intern, where he researched a variety of state-level issues for Senate Counsel staff, including transportation, education, and labor. During law school, Kyle was a member of UW Law’s Technology and Public Policy clinic. There he worked on civil rights issues created by Artificial Intelligence and on regulatory issues created by Blockchain in the public and private sectors. Kyle also worked as a judicial extern at King County Superior Court Judge Barbara Mack and at the Washington State Supreme Court for Justice Mary Yu. 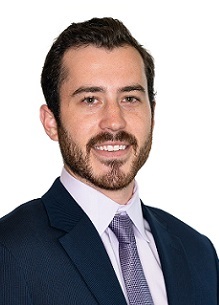 Kyle graduated from the University of Washington School of Law in 2018, and Pacific Lutheran University in 2015. He speaks French fluently, has working skills in Spanish, and has basic capacity in Mandarin Chinese.